Normally, federal annuitants don’t received their 1099R Tax Forms by regular mail until the end of January or the beginning of February. If you are registered to use OPM’s Retirement Services Website your 1099R is now available for download. I visited the site on January 16, 2019 and was able to download my copy that I will use for my 2018 tax return. To get a head start on your taxes visit OPM’s web site and download a copy. You must be registered to use the site. If you aren’t registered read the article titled “Connect to OPM’s Online Services” to understand the registration process and sign up. It doesn’t take long, however, you may have to wait for your password to be sent via regular US mail and that can take several weeks. 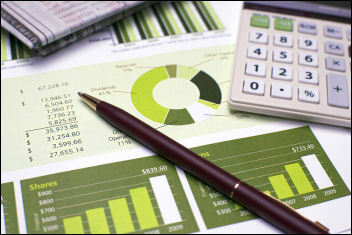 Many bank and brokerage 1099 and DIV reports are also available online and can be downloaded from your accounts. This can expedite the completion of your tax return. The government shutdown may slow things down this year since the IRS will not process paper tax returns until after the shut down is over. However, the postal service will still post mark your paper filed return. Any tax return postmarked by the due date will be considered filed on time by the IRS. Even if the shutdown is ended soon processing delays can be expected. I’ve personally used Turbotax software since they first issued this helpful software package. It’s intuitive and walks you through the entire process, double checks your work, and they allow you to file online. This software can also download and integrate your brokerage accounts into your tax return, saving you much time. Take advantage of OPM’s early 1099R online availability if you wish to file early or simply need to replace a lost 1099R. OPM issued a FACT SHEET covering the impact on federal employee benefits and pay as a result of the government shutdown. The following excerpt explains the impact on employee’s pay and benefits. This information covers pay and benefits matters that may be important to employees if the lapse in appropriations continues past payroll processing deadlines. Payroll deadlines vary from agency to agency, so the actual timing of when an employee’s pay and benefits may be impacted will vary. “Excepted” from furlough (i.e., continuing to work and earn pay, but their pay is delayed until appropriations are authorized). Employees who are “exempt” from the lapse in appropriations (e.g., because they are not paid from annually appropriated funds) are not impacted. Furloughed employees: You cannot receive pay during a lapse in appropriations if you are furloughed, and Congress will determine whether you will receive retroactive pay for furlough hours. Excepted employees: You are entitled to be paid for hours worked, but you cannot receive pay until funding is provided. Any leave you had previously scheduled during the lapse period is cancelled, so you won’t be charged leave. In addition, per OPM guidance, if you had properly scheduled “use-or-lose” annual leave that you weren’t able to use because of the lapse in appropriations, that leave must be restored to you. Your agency will provide instructions on any action you may need to take. Furloughed employees: You won’t accrue annual and sick leave during the furlough once you’ve been in a nonpay status for 80 hours (for full-time employees with a regular 80-hour biweekly tour of duty). Congress may, however, authorize retroactive accrual of leave. Excepted employees: You will continue to accrue leave, but accrued leave will not be available for use until funding is provided. No retirement deductions will be made if you aren’t receiving pay. Generally, a period of nonpay status will have no effect on an employee’s retirement-creditable service or high-3 average pay unless the nonpay status is for more than 6 months during the calendar year. Since no allotments can be made if you’re not receiving pay, you may want to review your allotments to determine whether you’ll need to make alternative arrangements (e.g., if you are using allotments to pay loans, alimony, etc.). Furloughed employees are eligible to apply for unemployment benefits, but excepted employees working on a full-time basis are generally not eligible. Employees who wish to file should do so with the Unemployment Office for the state where the employee worked (i.e., last official duty station prior to furlough). Please be advised, however, if Congress authorizes retroactive pay for furloughed employees, you would be required to pay back any unemployment benefits you received, in accordance with State law. For more information see OPM’s Pay-Leave Guidance and the U.S. Department of Labor’s Unemployment Compensation for Federal Employees website, https://oui.doleta.gov/unemploy/unemcomp.asp. FEHB coverage continues even if you don’t receive a paycheck. Your share of premiums will accumulate and be withheld later when the lapse ends and employees can be paid. Your FSAFEDS payroll deductions stop when you don’t receive pay. You remain enrolled in FSAFEDS, but you can’t be reimbursed for eligible health care claims until you return to pay status and your payroll deductions can be made. Payroll deductions will be subsequently collected to match your annual election amount. Eligible dependent care expenses incurred during the lapse in appropriations may be reimbursed up to whatever balance is in your dependent care account—as long as the expense incurred allows you (or your spouse, if married) to work, look for work, or attend school full-time. Your coverage will continue. 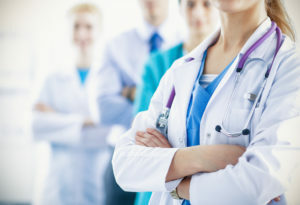 However, if you usually pay your premiums through payroll deduction, and the lapse period is less than three consecutive pay periods, your accumulated premiums will be withheld when the lapse ends and employees can be paid. Otherwise, Long Term Care Partners will begin to bill you directly for premium payments. You must pay those bills on a timely basis in order to continue your coverage. Coverage continues for up to 12 consecutive months of nonpay status, but premiums are collected only for pay periods for which you receive pay. Your coverage will continue. However, if the lapse period is less than two consecutive pay periods, your premiums will accumulate and be withheld later when the lapse ends. If you do not receive pay for two consecutive pay periods, BENEFEDS will begin to bill you directly for premium payments. You must pay those bills on a timely basis in order to continue your coverage. For information on the effect of a furlough on your Thrift Savings Plan contributions, loans, and investments, please refer to https://www.tsp.gov/index.html. Employees enrolled in their agency child care subsidy program should contact their agency HR office for information about payments. Employee Assistance Program (EAP) services can be helpful in providing confidential counseling with experienced, licensed counselors, and many EAPs can provide access to legal and financial consultation services. Contact your agency’s EAP office to determine what services might be available to you. Some mortgage, loan, credit and utility providers have indicated that customers may qualify for alternative arrangements. Please contact your providers for more information. 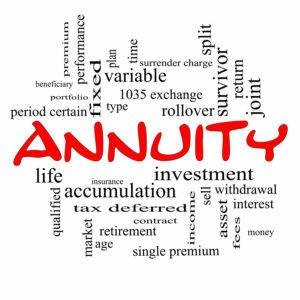 OPM sent out a notice of annuity adjustment in late December to all annuitants and survivor annuitants. I received mine on December 22. This document, the first for 2019, includes your new monthly payment resulting from our recent 2.8% COLA Adjustment. There’s a lot of important information included on this form and I keep them in my retirement folder for future reference, along with all correspondence received from OPM. This document is a wealth of information, it lists your previous and new year’s gross annuity with all deductions and so much more. First, you should know that your 2019 deductions may change shortly due to health care premium changes resulting from the recent FEHB Open Season. You may receive a new Notice of Annuity Adjustment in February listing federal dental and vision care premium increases. The current notice does list your primary FEHB plan increase in a statement under the Notice of Annuity Adjustment Chart. Also, anytime you initiate a change to your checking/savings allotments, state or federal tax withholdings, or anyone of 89 deductions or additions listed on the back of this notice, you will receive a new annuity adjustment in the mail. The first adjustment that we receive each year also includes the monthly survivor annuity currently payable in the event of your death to your spouse. It actually lists the gross monthly amount payable to your named spouse. This is listed just below the Adjustment table on the form. This form also includes your retirement claim number and suggests having this number available when contacting OPM about your retirement benefits. I typically highlight the key information on this form and place a copy with my estate plan. You will also find valuable information about your survivor elections on the back of the form along with OPM contact information and a list of the codes used for deductions and additions. Enter your new 2019 annuity values provided on this notice in our updated Projected Annuity Calculator. My annuity has increase over 33% since I retired in 2005. This calculator lets you project annuity growth through 2059! Those who elect a survivor’s benefit can calculate their total value without the survivor election using the data provided by this notice. For example, if your spouse’s monthly survivor annuity currently payable in the event of your death is $2,750, multiply that number by 12 to determine the spouse’s annual benefit, $33,000 a year in this example. If you elected a full survivor’s benefit your spouse receives either 55% for CSRS or 50% for FERS annuitants full annuity amount for life. To elect a full survivor annuity for your spouse your annuity is decreased by 10% for FERS and just under 10% for CSRS annuitants. To determine your full CSRS annuity amount, without the spousal election deduction, divide $33,000 in this example by .55 (CSRS) which equals $60,000 a year. Use 50% for a full FERS survivor’s benefit. Many annuitants assume their spouse will receive 50% or 55% of what they are currently receiving yearly. The surviving CSRS spouse receives 55% and the FERS spouse receives 50% of what your total annuity would be without a survivor annuity election. This is also the amount a federal annuitant would receive if their spouse dies while the annuitant is retired. Another way to look at this is that the surviving spouse for a CSRS annuitant will receive approximately 60% of what the couple receives prior to the annuitant’s death when the annuitant selected full survivor benefits. A surviving spouse for a FERS annuitant will receive about 55% of what the couple receives prior to the annuitant’s death when the annuitant selected full survivor benefits. Many retirees and survivor annuitants call OPM to change direct deposit information and become frustrated because they can’t get through, their line is busy most of the time. OPM services 2,113,414 federal annuitants, 523,737 survivor annuitants plus postal service retirees as well. It is easy to change monthly annuity payments from one financial institution to another if you understand your options. 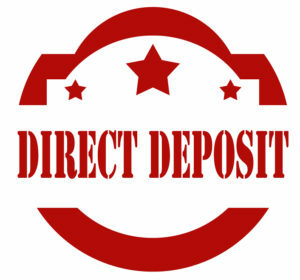 Direct Deposits will continue to be received by the originally selected financial institution until OPM and the U.S. Treasury are notified by the payee that the payee wishes to change the financial institution receiving the Direct Deposit. It’s recommended that the annuitant maintain accounts at both financial institutions until the transition is complete. Don’t close your original account until after the new financial institution receives your first Direct Deposit payment. If you are already receiving your federal benefit payment by direct deposit, and would like to have your payments sent to a different account use the procedures that follow to make the change. Recently, OPM and the U.S. Treasury made changes to the program including updating the link to the SF 1199A form. To enroll in Direct Deposit or to change your enrollment to a new account, OPM needs to know the routing number of the financial institution and your account number. The financial institution will provide this information or you can locate this information on the checks you use. 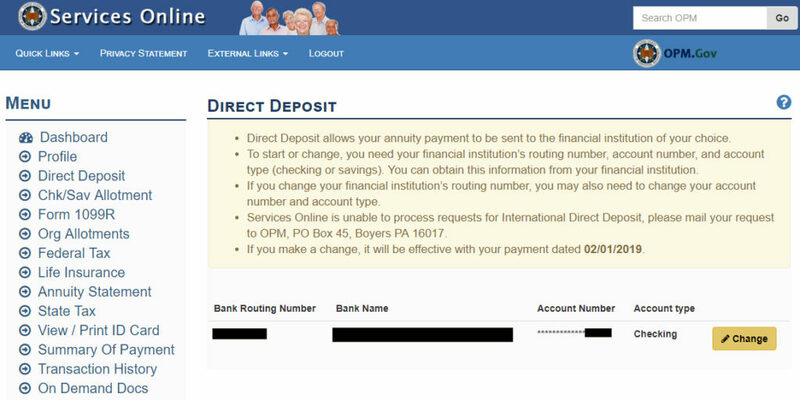 Mail an SF 1199A form to OPM, Retirement Operations, PO Box 440, Boyers PA 16017-0440. Call OPM at 1-888-767-6738. Please be sure to have your bank routing number and account number handy. OPM’s line is frequently busy, call early and often throughout the day to get through and you must have your retirement claim number or Social Security number available. Using OPM’s Retirement Online Services makes changes like this easy, you can make this change online after registering for the free service. I signed into my account, see following graphic, and clicked on Direct Deposit. The blacked-out areas hide my personal account information. All you have to do is click on change and enter your new bank routing and account numbers. When you access the Direct Deposit page it will state what date your change will take effect in the last line above your personal data. The menu to the left on the Services Online graphic show all that you can do once registered. You can obtain duplicate copies of your 1099 R statement, print out a statement outlining all of your life insurance coverage, initiate or change allotments, increase or decrease state tax withholding, print out a statement of your annuity that you can provide to lenders for loans, and much more. It is worth the time and effort to register for this service. To register you must call OPM and they will send you access information in the mail. Yes, I know it’s difficult contacting them by phone. What I do is dial their number, if its busy I hang up and immediately click on redial, I typically get through in several minutes using this technique. Expect long wait times, I’ve waited on hold for up to 45 minutes. The wild stock market swings are heavy on the minds of investors today, especially for those approaching retirement and retirees living on a fixed income. It is even more problematic if you depend on Thrift Savings Plan (TSP) and other retirement account withdrawals. Market volatility is uncomfortable to say the least when you see what you worked a lifetime saving shrink dramatically, sometimes overnight. I wrote several articles about coping with market fluctuations and how to shelter your nest egg from the coming storm. I don’t care how seasoned of an investor you are, market volatility is a concern and all ponder the ramifications of a major correction. The S&P on December 6, 2018 was on course to have its worst performance in 7 years! 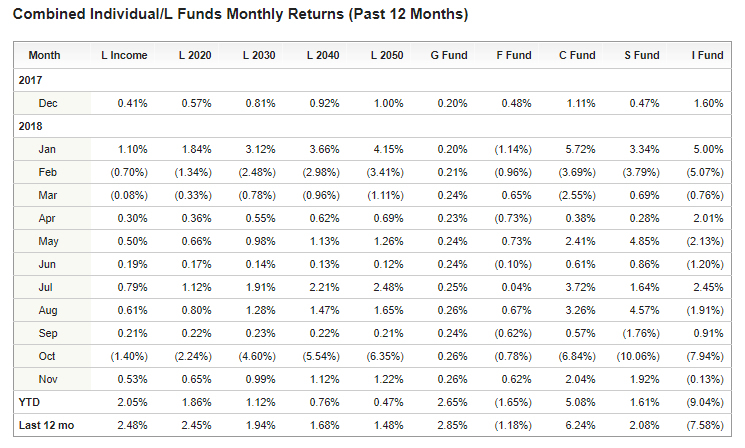 The following chart, excerpted from the TSP website, shows the current year and last 12-month fund performance. 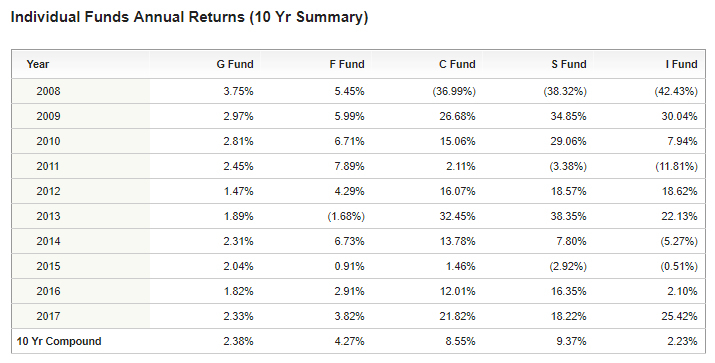 The ultra-conservative G Fund has outperformed all but the C fund over the past 12 months. Reviewing this chart confirms 2018 did not perform as many had suggested at the beginning of the year. The returns are meager and could worsen if December stock market performance doesn’t improve. After 10 years of gains it is what can be expected. At the beginning of the year many talked about how foreign stocks were undervalued and should perform well in 2018, just the opposite happened as the market dynamics changed. The concern from this point on is where is the market heading over the short and long term. In the referenced article I state, “Over the past 120 years there has been many recessions and of course the great depression that started in 1929. From the early 1900s on there have been four major recessions with the longest recovery period from 1929 to 1955, 25 years! The average recovery period was 16.5 years. The shortest recovery period lasted only six years from 2009 to 2015. What most of us have experienced since 1985 are bull markets interrupted with one recession running six years from 2009 to 2015. Yet, the most recent recession always seems so much worse than earlier periods since it is fresh on our minds.” It’s the recovery periods that give those approaching retirement and retirees pause. The good news is that over time good investments recover as outlined in the following TSP Annual Return Chart excerpted from the TSP website. A well-diversified core portfolio can provide the balance you need to whether stock market volatility. However, the more conservative you are the faster the recovery will more than likely be. Yes, we all are concerned when markets fall dramatically but it isn’t the end of the world. It’s the beginning of a new reality and one that we have to deal with. 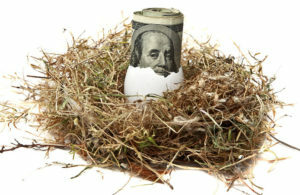 Most reduce their investment risk if they will need to withdraw from their retirement accounts to live comfortably. Plus, they may sleep better at night knowing their account balances will be there when needed. I wrote an article late last year titled “Where Are You Now! Looking at The Numbers” that helped readers evaluate their finances and determine if they had sufficient resources to live comfortably pre and post retirement. We provide extensive financial planning guidance to help anyone from a new hire to a retired annuitant evaluate and assess their financial strength. I mentioned in last year’s article, “few evaluate their finances until their checks start to bounce or they are so much in debt they can’t dig themselves out.” One of the leading causes of divorces today is due to finances and not living within your means. I recently developed an 8-page Budget Work Sheet that helps individuals and couples determine where they stand pre and post retirement. The worksheet guides you through listing your income from all sources, loans and debts, utility costs, insurance premiums, monthly savings and investment contributions, and miscellaneous expenses. An individual or couple will know what they are bringing in each month, their total expenses, and where they stand financially. This worksheet isn’t an excel spreadsheet, it’s a pdf file that you can download and print out. Just lay it out on the table for you and your spouse/partner to fill out together with pen or pencil. It evokes discussions and doesn’t require sitting at a computer to complete. This way everyone knows firsthand where the household money is being spent and how much is needed each month to make ends meet. Working couples often neglect to balance the books so that each party equitably supports the household to the degree possible. When this happens, it places an unfair burden on whomever is paying the bills and can lead to marital discord. This work sheet includes a Common Expense column for working couples that reveals how much is needed monthly to support the family. Many newlyweds enter marriage without sufficient financial planning, they are in love and neglect to address the elephant in the room; making financial ends meet. Of course, this is natural to a certain extent especially for the very young. My wife and I are a prime example. We married young, my wife was 19 and I barely 20, while I was in the military earning a measly $98 a month! That was about one third of the minimum wage back then. We flew to Biloxi Mississippi with a few hundred dollars in our pocket, no car, and not knowing what laid ahead. Yet, we persevered and flourished. Most starting out like this end up divorced early on. Fortunately, federal employees have great benefits, good pay, and are generally older and wiser than the very young at heart. Yet, they too often enter a relationship with blinders on and neglect to take the necessary steps early on in their relationship to right the ship and balance the financial load placed upon them. This worksheet allows individuals and couples to evaluate pre and post retirement expenses, there are columns for both entries. 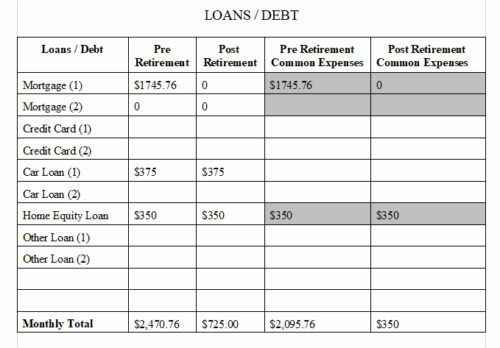 For example, under LOANS / DEBT there are four columns as noted on the excerpted table below. If you pay off your mortgage when you retire the post-retirement column would show zero dollars for your monthly mortgage payment. We extend that to common expenses both pre and post retirement for couples to determine what expenses to share when both have income. In this case the mortgage would be a common expense pre-retirement and zero dollars post-retirement. A car loan could be considered an individual expense if both have a car and income. Tailor the chart and add additional common charges if relevant. I highlighted the expenses that most would consider to be shared by working couples. A single person wouldn’t need the common charges identified because there would not be anyone to share the costs with. This process works for everyone. Common expenses show the amount needed each month from working couples to pay the household bills, save for a rainy day and how much is spent on each line item. If you are a married couple and one is a stay at home mom or dad the working spouse generally earns enough to take care of business and keep things running. Married working couples, each earning about the same, could equally split the common expenses. 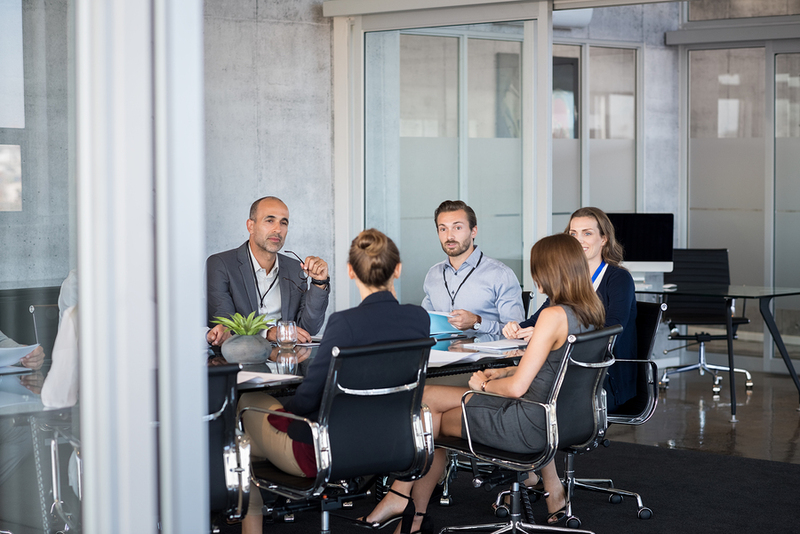 When one partner is still working and another a retired annuitant the division would be decided by the pair as to what each can contribute based on all income sources; salary, pension, Social Security, 401k distributions, etc. This exercise helps working couples share expenses equitable when both have sufficient income to contribute. At the very minimum, it effectively reveals total income to expenses so that you can see if you have anything left after paying the monthly bills. Another key benefit of completing the worksheet is to discover where all of your money is going each month. Much of the younger generation today don’t know how to balance a checkbook. They use their debit cards until they are rejected for insufficient funds. Then, they go online to see what their balance is and wait for the next paycheck or transfer money from a savings account if they have one. After completing the worksheet, you will know where and what you are spending your money on and be able to evaluate ways to trim costs. Possibly drop unnecessary cable options, program your HVAC thermostat to reduce utility expenses, replace incandescent bulds with LEDs, cut down on your trips to Starbucks, change to a lower cost cell phone service, and so on. There are many ways to economize today. It’s a good idea for couples to open a joint checking account in addition to their individual checking accounts. If both are working, each would deposit their share of the common expenses in the joint account each payday for the bills. The excess in the joint account would accumulate for emergencies and discretionary items or you can set aside emergency or vacation savings in a separate account. This way, the person paying the bills should have sufficient funds each month to pay the bills. Even if only one person is working a joint account is necessary so both can pay bills and sign checks. This is a dynamic process, expenses and income change over time. It’s imperative to revisit your worksheet at lease once a year or whenever there is a major change such as a pay raise, someone retires, or for younger couples when a child is born. Open season starts November 12th. There are tools available to evaluate provider options and help you select your 2019 plan. Use the following resources to make an informed decision for you and your family’s health care needs. Request hard copies of desired plan brochures through your benefits coordinator. If you don’t know who that is talk with your supervisor. Download plan brochures from the OPM website. Request copies direct from the plan providers. I requested and received brochures direct from GEHA and Blue Cross Blue Shield weeks before they were available on the OPM site. Sign up for FEHB Open Season Online – This site is devoted to federal annuitants. Request plan brochures to be mailed to your home address or you can download brochures to your computer. You must register to use this site and annuitants can change enrollments online. Request copies direct from plan providers. Determine Plan Costs – 2019 FEHB Plan Rates (All rates are now posted online). I compared the Blue Cross Blue Shield Basic and Focus plans to the GEHA Standard Plan for my last article. Annuitants can change plans online at FEHB Open Season Online. The online service is easy to use and you can track your change submissions. Call Open Season Express 1-800-332-9798. When sending requests by mail clearly state your Open Season request. If you are making an enrollment change, be sure to tell OPM the plan you want, the type of coverage (Self Only or Self and Family), and the enrollment code. You must include your annuity claim number and social security number on your request. If you are choosing Self and Family coverage, we will also need your dependent and other insurance information as specified in the instructions mailed to you at the beginning of Open Season. You may be able to enroll online using Employee Express. Department of Defense employees can enroll using the DoD automated enrollment systems. Health and Human Services and Department of Veterans Affairs employees can enroll using MyPay. Department of Energy employees can enroll using the DOE automated systems. S. Postal Service employees can enroll using the PostalEASE online and telephone enrollment system. Dental and vision benefits are available to eligible Federal and Postal employees, retirees, and their eligible family members on an enrollee-pay-all basis. Enrollment takes place during the annual Federal Benefits Open Season in November and December. New and newly eligible employees can enroll within the 60 days after they become eligible. Register online at www.BENEFEDS.com to review and download plan brochures, use their plan comparison tool, and to initiate a change or cancel enrollment. I compared several plans this morning using their comparison tool. If you aren’t a registered user sign up now. You will be able to review your Dental, Vision, Long Term Care and Flexible Spending accounts. Enrollees can initiate changes during open season, when there is a life event change, or to cancel coverage at any time. For enrollment/premium questions regarding dental and vision insurance, contact BENEFEDS at 1(877)888-3337.
Review the following articles that describe the impact Medicare has on your FEHB provider payments.